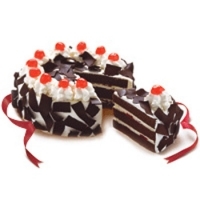 Mouth-watering liquor-moistened chocolate cake, brimming with cherries, cream and generous strips of chocolate shavings. We can deliver red ribbon cake most of the city proper if there is nearby red ribbon to the recipient area. Otherwise, recipient needs to pick up of the item from nearest red ribbon if delivery location out of area. Provincial red ribbon required 2-3 days advance order. If you order item only from red ribbon we will use red ribbon delivery service, however you�re greeting will be include.